When Does "Should" Really Mean "Shall"? 7.9.5.1 Does Annex C(1)(g) impose a positive obligation? 7.426. Japan relies on prior panel and Appellate Body rulings to argue that the word "should" can have either a normative or a hortatory meaning. Japan further argues that read in the light of its context, in particular Article 8 and the chapeau of Annex C(1), subparagraph (g) denotes a positive obligation. Japan further supports its argument with a reference to reports by a panel and by the Appellate Body, which mention subparagraph (g) as one of the obligations listed in Annex C(1). 7.427. Korea contends that the interpretation of Annex C(1)(g) must give effect to the plain meaning of the term "should", which expresses exhortation rather than obligation. Korea also contrasts the use of should in subparagraph (g) with the use of shall as well as indicative forms "are" or "be" in other provisions of the SPS Agreement. Likewise, Korea juxtaposes the language of Annex C(1)(g) with that of Article 5.2.6 of the TBT Agreement, contending that the mandatory nature of the latter is explicit through the use of the verb "are". According to Korea, this difference in the language of various provisions ought to be given effect. Korea relies in that regard on the panel report in US – Animals, which found that the use of should in Article 5.4 of the SPS Agreement denotes exhortation. Korea concludes on that basis that Annex C(1)(g) is merely a "best effort provision" that encourages Members to minimize the inconvenience on importers in application of criteria for sampling and siting of facilities. 7.428. The Panel begins its interpretation of Annex C(1)(g) with reference to the relevance of the term "should". As regards its plain meaning, "should" is somewhat of a chameleon in the treaty text and the Appellate Body found in Canada – Aircraft that, depending on the circumstances, should can express either an exhortation or an obligation. 7.429. The panel in US – Animals, observed that "the use of 'should' as opposed to 'shall' in any particular provision of [the SPS] Agreement was a deliberate choice." The Panel further notes that the use of "should" in subparagraph (g) contrasts with the use of indicative forms "is" or "are" in subparagraphs (a) through (e), (h) and (i) in the same Annex. The Panel agrees with the Appellate Body that "the choice and use of different words in different places in the SPS Agreement are deliberate, and … the different words are designed to convey different meanings." Following the approach of the Appellate Body in Canada – Aircraft and Mexico – Taxes on Soft Drinks as well as the panel in US – Animals, a conclusion on whether "should" is used as an exhortation or to express a duty or obligation must be based on the context of the provision as a whole. Thus, it would be inappropriate for the Panel to assume that because "should" is exhortatory in Article 5.4 that it is automatically the same in Annex C(1)(g). The Panel must base our determination on the context of the provision. The Panel, therefore, now turns to the context of subparagraph (g). 7.430. First, the Panel notes that the word "should" in Annex C(1)(g) is followed by "so as", which connects the two parts of the provision. Unlike a more attenuated expression "take into account" used in Article 5.4, which requires consideration of relevant facts, "so as" denotes a result or a consequence, which subparagraph (g) aims to achieve. Given the more tenuous language of Article 5.4, as well as the different context of that provision, it would be inappropriate to apply the conclusions reached by the panel in US – Animals under Article 5.4 to Annex C(1)(g). The Panel understands that the use of should in Annex C(1)(g) is meant to emphasise that the purpose of the provision is to minimize the inconvenience to applicants, importers, exporters or their agents and consistency with the obligation would be determined in that light. 7.431. Likewise, the Panel is not persuaded by Korea's argument juxtaposing the language of Annex C(1)(g) and Article 5.2.6 of the TBT Agreement. The Panel notes that, unlike Annex C(1)(g), Article 5.2.6 does not require using the same criteria for siting of facilities and the selection of samples, but that these criteria "are not such as to cause unnecessary inconvenience". Annex C(1)(g) is thus at least as specific in its content as Article 5.2.6 of the TBT Agreement, which, Korea argues, is an example of a positive obligation. We cannot, therefore, agree that the differences in language between Article 5.2.6 of the TBT Agreement and Annex C(1)(g) can support an interpretation of subparagraph (g) as a hortatory provision. 7.432. The Panel further notes that Article 8 and the chapeau of Annex C(1) provide respectively that "Members shall observe the provisions of Annex C" and that with respect to any procedure to check and ensure the fulfilment of SPS measures, "Members shall ensure" observance of subparagraphs (a) through (i). Both provisions thus instruct Members to comply with the individual subparagraphs of Annex C(1), implying that Annex C(1)(g) connotes a positive obligation. This understanding of the nature of Annex C(1)(g) is consistent with the Appellate Body's ruling in Australia – Apples that the "obligations contained in Annex C(1) are: … (g) that the same criteria be used in the siting of facilities used in the procedures and the selection of samples of imported products as for domestic products". 7.433. In sum, having regard to the language of the whole of subparagraph (g) as well as the rest of Annex C and the SPS Agreement, the Panel concludes that Annex C(1)(g) imposes a positive obligation on the Members to use the same criteria in the siting of facilities used in the procedures and the selection of samples of imported as for domestic products so as to minimize the inconvenience to applicants, importers, exporters or their agents. The Panel now moves on to assess Japan's claims under that provision. The Common Law Section of the Faculty of Law at the University of Ottawa invites applications for the following tenure-track faculty positions. Area of expertise: Public Law, Private Law, Criminal Law, International Law. The Chinese University of Hong Kong and the Leuven Centre for Global Governance Studies are jointly organizing a conference on "The EU and its Partners in Global Governance: Trade, Investment, Tax and Sustainable Development." The event will take place at the Chinese University of Hong Kong on 14-15 June 2018. For details, see the call for papers here. The Harvard International Law Journal is currently seeking submissions, and is particularly interested in receiving papers on topics in international economic law. View the call for papers here. On the 18th of November of 2014, the arbitral panel in the case El Salvador – Tariff treatment to goods originated from Costa Rica (CAFTA-DR/ARB/2014/CR-ES/18), issued its final report. Costa Rica activated the dispute settlement provisions of DR-CAFTA on September 2013 given the denial of preferential treatment by El Salvador to costarrican exports under DR-CAFTA. Among other things, the arbitral panel concluded that the omission by El Salvador to apply the preferential tariff treatment of DR-CAFTA to goods originated in Costa Rica, including those ones produced under special export regimes, violated articles 3.3.2 and 4.1 as well as Anexes 3.3 and 4.1. Based on the recommendations of the arbitral panel and considering the possibility established in article 20.15.3 of DR-CAFTA, the disputing parties in this case (Costa Rica and El Salvador) elaborated an action plan to allow El Salvador to implement all necessary measures to secure tariff treatment application to goods originated from Costa Rica under DR-CAFTA. The action plan included interim and final measures through a transition period of 6 months, after which all necessary measures would be needed to be implemented. Conversations between both parties were amicable and under a spirit of collaboration, which allowed to reach the agreement after just two meetings (one of them via videoconference). This positive result would have not be obtained without a provision as the one set in article 20.15.3, quoted above. The possibility to secure an action plan is beneficial to both parties. For the complaining party, it allows legal certainty on the time frame and type of measures that the respondent Party is going to undertake to secure compliance of the ruling of the arbitral panel, measures that were even designed with the complaining Party's participation. To the respondent, is also an incentive to include the complaining party in this process since it gives it certainty that the complaining Party would only be able to suspend benefits if the respondent failed to carry out the action plan, which ultimately depends on the respondent’s implementation efforts. In a way, the action plan acts as an interim phase between the final ruling of the arbitral panel and the suspension of benefits phase, and incentives both parties to negotiate the best way to implement the ruling and settle the dispute. "where the investor has acquired rights, or where the state has acted in such a way so as to generate a legitimate expectation in the investor and that investor has relied on that expectation to make its investment, action by the state that reverses or destroys those legitimate expectations will be in breach of the fair and equitable treatment standard and thus give rise to compensation." Other awards are to the same effect, holding in multiple circumstances that a state's frustration of an investor's legitimate expectations gives rise to liability under a fair and equitable treatment obligation. 9. It is well-settled that these principles apply even where a state has not expressly provided assurances of stability or other treatment to an investor: "there is an obligation not to alter the legal and business environment in which the investment has been made," and "stable and equitable conditions are clearly part of the fair and equitable treatment standard under the ECT." Or, in the words of another tribunal, "the Claimant's reasonable expectations to be entitled to protection under the Treaty need not be based on an explicit assurance [by a state]." 10. Of course, however, these principles necessarily apply even more emphatically where a state provides express or implied assurances of particular treatment or guarantees of particular rights to an investor or a defined category of investors. In these circumstances, the state's failure to honor its undertakings to an investor (or category of investors) constitutes a denial of fair and equitable treatment, giving rise to liability for compensation under international law. Thus, authorities recognizing a state's freedom to revise or alter its legislative or regulatory regime also declare that a state may nonetheless make commitments to particular investors (or categories of investors) not to alter aspects of the relevant legal regime, and that the violation of these commitments will constitute a breach of obligations to accord investors fair and equitable treatment. Indeed, the Czech Republic correctly recognizes that "a 'stabilization clause' creates an exception to the general rule that a State is free to amend or pass new laws without incurring BIT responsibility." 11. As the majority acknowledges, it is also clear that a stabilization undertaking or assurance can arise either from a specific undertaking to an individual investor (for example, in a contract or similar instrument) or from a more general legislative or regulatory instrument (for example, a statute applicable to a class of investors). Thus, it is well-settled that a state may, under international law, make a binding commitment to foreign investors in its legislation, rather than in individual contracts or specific representations to individual investors. The Czech Republic itself recognizes this well-settled principle: "What we're saying is that [legislation providing a stabilization guarantee] has to be very clear and explicit in terms of constituting a commitment of stabilization. So, if the Legislature says we're going to stabilize this legal regime, then, of course, that would apply, certainly. We're just saying that was not the case here at all." This concession was repeated on numerous other occasions. 12. This conclusion is compelled by the nature of fair and equitable treatment analysis, which focuses on the legal framework of a state, which seeks to ensure "fair," "equitable," and "just" conduct by states, and which serves to protect the legitimate expectations of investors. The decisive issue is not whether a state's undertaking is "specific" or "general," or statutory or contractual, but whether the statements and actions of the state provide a sufficiently clear commitment to give rise under international law to legitimate expectations or legal rights on the part of an investor. 13. Thus, long-settled international authority makes it clear that a state is fully entitled to make binding commitments to foreign investors by way of statutes or other legislative acts. 14. Similarly, the very basis for this investment arbitration - a standing offer to arbitrate by the Czech Republic in the Treaty- confirms that states may make binding commitments, and investors may acquire protected international rights, from "general" legislative provisions. The Treaty's arbitration provisions apply to, and protect, all German investors, notwithstanding the absence of any contractual arbitration agreement or other "specific" commitment to arbitrate with the Claimants. Precisely the same principles and logic apply to other types of guarantees provided by the Czech Republic, including guarantees in its domestic legislation. 15. In contemporary market economies, operating under the rule of law, it is both commonplace and essential for states to be able to provide undertakings to private parties by way of "general" legislative or regulatory instruments. In many circumstances, modern states cannot as a practical matter negotiate contracts with large numbers of parties, but must instead regulate the conduct of private parties through legislation and regulations. Indeed, this is a distinguishing feature of a system founded on the rule of law, where legislative and regulatory provisions, rather than individual governmental directions, govern private conduct. It would seriously impede the task of governance and regulation, and contradict aspirations for the rule of law, to deny states the ability to make commitments to private parties, including foreign investors, in the form of legislative (or regulatory) guarantees. 16. Put simply, and unsurprisingly, the Tribunal is in agreement that international law recognizes and gives effect to the power of states to make binding, internationally enforceable commitments to private parties. Where a state undertakes, by contract, legislation or otherwise, to provide specified treatment to a foreign investor, that undertaking will be given effect under international law, and violations of that undertaking will give rise to claims for compensation by the investor under commitments to provide fair and equitable treatment. In doing so, international law does not constrain the autonomy of states, but rather gives effect to it, by enabling states to provide reliable and enforceable commitments to private parties, in order to obtain necessary investments or other benefits from those parties. A key part of the reasoning comes in para. 16: "Where a state undertakes, by ... legislation ... to provide specified treatment to a foreign investor, that undertaking will be given effect under international law, and violations of that undertaking will give rise to claims for compensation by the investor under commitments to provide fair and equitable treatment." This view of fair and equitable treatment seems quite broad, with important implications. If special interests -- say, oil companies -- lobby a government for subsidies, and that lobbying results in a statute providing for subsidies to the oil companies (an "undertaking" for "specified treatment"), would this interpretation mean that the government cannot later rethink its decision to give subsidies to the special interests without paying compensation? That is, once those subsidies have been promised, do they have to be paid? On its face, it seems to me that this is the direction the interpretation takes us. One obvious problem is that it would seem to reinforce crony capitalism, by making it binding once undertaken. After the special interests have lobbied for their subsidies, there's no way to avoid paying them. Beyond crony capitalism, there is also the more general issue of governments changing course on policy. Taking the environmental policies at issue here as an example, governments may, over time, reconsider whether solar, wind, nuclear or something else is the most effective way to address climate change. But if this interpretation of FET is followed, and governments have to pay to change policies, they may end up locking in a policy that no longer makes sense. More generally, governments regularly take action to give tax or regulatory advantages to private parties (e.g., real estate investors, steel companies, solar or fossil fuel companies, agriculture producers). Sometimes they even have a public policy purpose in mind, and the benefits to the specific private parties are not the only consideration. But anyone who follows politics and public policy knows that governments' priorities can change. New elections mean new politicians. Or policy failures cause a rethink. Or special interests influence the process. Or internal political battles reach a different result. Or governments just arbitrarily change course. Thus, is it really ever reasonable to expect that government policies will remain constant, and that promised subsidies must be paid no matter what? And should there be an international remedy when governments do change their mind on policy? With all that in mind, it is difficult to understand why any government would support an interpretation like the one here. Does this solve the problem? I'm not sure it does. The way the provisions are phrased seems too narrow. They state that "the mere fact" that something has happened is not enough for a breach. But I'm sure that the claimants in these cases can easily explain why it is not just "the mere fact" of X that concerns them, as there is some broader context at issue as well. So if governments want to avoid losing cases of this kind at some point, they may have to be a little more clear in the drafting. In the movie Shadowlands, the character C. S. Lewis says, “We read to know that we’re not alone.” For me, perhaps it is also true to say, “I write to know that I am not alone.” Implicit in Is International Law International? is a series of questions: Have you seen what I have seen? Do you analyze it in the same way? If not, what has your experience been and what do you make of that? How and why are your reactions similar to or different from mine? And what does that mean regarding whether international law is, should be and can be international? I want to thank EJIL: Talk! and Opinio Juris for hosting, and the contributors for engaging in, this sort of dialogue. Two common themes of the contributions are that my book represents the start of a conversation rather than the final word and that it provides a platform for future research. I agree. My book is a big-picture macrosketch based on detailed microobservations that seeks to challenge existing understandings. A lot of details need to completed, analyses tested, additional points noted and implications thought through. In the spirit of continuing this exchange, I offer some reflections below. Before doing so, I wanted to note that, reading the comments, I was struck once more by how much we approach international law from our particular national perspectives. Whether it is Vera Rusinova reflecting on international law through the iron curtain, Hélène Ruiz Fabri drawing connections with debates in the French literature, Marko Milanovic considering the differences he has experienced in the US and UK academies, or Bing Bing Jia providing insights into Chinese international law textbooks, each of us brings our biography into play when analyzing our field. Of course, this observation is part of the point of my book. But it also means that we won’t be able to access the richness of this variety, in both sources and perspectives, unless we diversify our interactions and networks. Ruiz Fabri was very perceptive in noting that writing a book like this was a “risky enterprise” and that it “might be a good way to displease many people.” This book indeed deals with touchy subjects. On the personal level, it suggests that we international lawyers are often not as cosmopolitan as we like to think. On the political level, it raises awkward questions about the implications that might flow from different understandings of and approaches to international law in light of changing geopolitical power. Although the book deals with controversial issues, I think it needed to be written. I am drawn to academic issues that intrigue me or make me feel intellectually uncomfortable. This book did both. Just as many readers have felt unsettled reading it, so I felt unsettled writing it. I coped with that discomfort by seeking to render as balanced a picture as I could, typically presenting both sides of issues rather than taking a normative stand about which one I thought was preferable. I showed that strengths often contain weakness and vice versa. I subjected myself to the same critique as I asked my readers to undertake. Given the potentially provocative nature of this book, I want to thank my OUP editors John Louth and Blake Ratcliff for supporting it. The book was unlike anything I had done previously. It did not conform to standard approaches to legal scholarship. It was clear from the outset that the work would involve shaking echo chambers and had real potential to offend. Despite these risks, they immediately and intuitively understood what I was trying to do, from our first coffee chat. I am genuinely grateful that they were unwavering in their support and insightful in their critiques. To my surprise, instead of encountering a wall of hostility, my book has opened rather than closed dialogues. I have received emails from all around the world and often my interlocutors shared personal stories about their experiences of the divisible college of international lawyers in both academia and practice. For instance, much to my regret, I was unable to include an analysis of a Latin American state in the book. Instead of spurning it, numerous Latin American scholars have reached out to tell me their side of this story (e.g., Francisco-José Quintana about the problems with teaching the Falklands/Malvinas dispute in Argentina using UK textbooks). The book is an invitation for self-critique and dialogue. I hope that it prompts many conversations, even if some of them are uncomfortable. Academia is meant to challenge the status quo and shake up things up. Taking risks is part of the point. In reading the book, Ruiz Fabri found herself wondering about its nature. Was it “A sociological inquiry? A manifesto? A plea? Against arrogance? Against a new Empire? For comparison? For pluralism? Maybe a bit of all this?” This is an insightful question and one that I have pondered more since writing the book. It is also one that Paul Stephan astutely, if partially, answers. I have come to see this book as embracing what sociologist of globalization Saskia Sassen describes as a “Before Methods” approach. Complex global phenomena and emerging or underanalyzed issues are helpfully dealt with by first stepping back and seeking to destabilize our existing understandings of the world and the conceptual frameworks we use to describe it. Often particular concepts, framings and metrics obscure as much as they reveal. This approach requires one to sketch and project, and to connect microobservations to macroforces in an iterative observational and analytical process. As Stephan notes, such work must be done analytically prior to many other projects: my book “strips away preconceptions and mystification” with a view to setting the scene for social justice projects and instrumental and empirical analyses. For instance, although the book engages in some empirical analysis, it doesn’t pretend to be exhaustive or a champion of sophisticated methods. Similarly, the book describes and explains international law and lawyers’ fragmented reality but does not take the next step of providing a normative framework for assessing which approaches are better or worse. Good scholarship is often completed in layers. As Stephan concludes, this book “expose[s] the forces that bring about systematically different cultures of international law in different parts of the world” but leaves others to explore “the link between disaggregated cultures and the international law that results.” It is the horse before the cart. It seeks to open our eyes to many issues, analyze their origins and effects, and provide a framework and vocabulary for talking about them. The book doesn’t answer every question but makes many new questions possible. The same sentiment underlies Rusinova’s conclusion that the effect of this book will ultimately depend on what other international lawyers do with it. According to Rusinova, the book should be understood as a challenge to international lawyers to ask themselves, “Do I realize which boundaries surround me in the discipline and am I, at least, trying to act above them?” Thus, she concludes that “it is in our own hands to make [the book] change the ‘world of international law.’” Yet, as Ruiz Fabri notes, much will turn on how those in the privileged inner circle (the “International Bubble,” as she calls it) respond to the critique. Jia’s contribution constitutes a very good example of analyzing the promise and perils of comparison. As Jia notes, and as I found through my study, although textbooks and casebooks from some states contain good information about the practices of those states, that does not hold true for all states. In particular, Chinese international law textbooks often draw heavily on the approach of Oppenheim and Brownlie and feature little Chinese practice or views. If these books weren’t written in Chinese (a bit of a giveaway), I could easily have mistaken them for not being Chinese, except for their treatment of a handful of issues like Taiwan and the South China Sea. 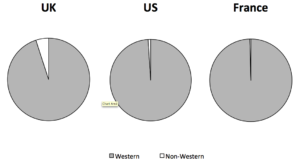 Any metric that one uses to compare international law or international lawyers across states will be limited because metrics that make sense in one context often don’t make sense in another. This problem is one of the perils of comparison and it explains why one needs to adopt many approaches and metrics to build up a more complete picture. But it is also part of comparison’s promise. Thus, rather than accept the status quo, Jia suggests that the time has come for China to adopt a new generation of international law textbooks that, among other things, give the reader more information about China’s approach. I concur. How such a development plays out remains to be seen. The future for Chinese international textbooks seems caught between two forces. On one side, some academics are developing casebooks that are much closer to US-style casebooks, particularly in international economic law. On the other side, the Chinese government has stepped up its censorship of academics and has now sponsored the creation of a quasi-mandatory textbook on international law that is meant to feature Chinese socialist characteristics (though these attributes are apparently pretty sparse in the first edition). This struggle between nationalized, denationalized and westernized approaches is happening before our eyes and may evolve differently with respect to form and substance. The last point on censorship links to an important factor that Milanovic and Julian Ku highlight. Not all states have robust traditions of academic freedom or free speech more generally. If we are going to diversify our networks and sources, how should we assess scholarly opinions coming from authoritarian states like China and Russia where there is evidence of significant external and internal censorship? This issue arises in my book in the discussion of textbooks and in my account of the virtual uniformity of Chinese and Russian academic views – as well as their conformity with the positions of their states – with respect to the South China Sea arbitration and Crimea, respectively. Although I deliberately refrained from making legal judgments in the book as my purpose was to identify, explain and analyze the divisible college, I am not averse to people reaching such conclusions. Much of this is a question of sequencing. My suggested approach is: (1) seek to engage, listen and understand, (2) seek to test your assumptions and argue your position, (3) identify and justify your framework for assessing different positions, and (4) engage in judgment. I emphasize steps one and two in my book because too often I see international lawyers go straight to step four, missing steps one and two and simply assuming step three. Steps one and two are crucial for building knowledge, self-awareness and networks. For international law to move forward, however, one of the central challenges will be deciding when to recognize divergent interpretations as valid and when to conclude that some venture beyond the pale (step three). And this may end up being contested. In developing such frameworks, we all need to be attentive to our blind spots and biases, but we should also pay attention to those of other national communities. I agree with Milanovic’s conclusion that the international reputation of a group of national scholars will depend significantly on their ability to take positions that are independent from those adopted by their state. Discerning the dividing line is most difficult in academies, like the Chinese and Russian ones, that have what Milanovic describes as “some non-negligible level of academic freedom.” Levels of freedom are also likely to vary across fields and issues. Scholars might have more freedom with respect to international economic law and less concerning core national interests, for instance. Although this will always be difficult to judge, it is much harder to do so if you don’t have networks in and knowledge of these academies. In terms of the South China Sea case, I agree with Ku that the uniformity of the Chinese scholars’ views on the South China Sea worked in the end to damage their credibility and that their “going out” approach worked hand-in-hand with the government’s media campaign. However, at least based on my networks and knowledge – which are necessarily partial and subjective – I think that Western international lawyers often dismiss the objection of Chinese scholars to the SCS tribunal’s jurisdiction as being purely politically motivated when my sense was that it was usually genuinely held. By contrast, I believe that politics were at play behind the lack of criticism by some mainland Chinese scholars of China’s refusal to participate in the arbitration and abide by the award. In addition to considering academic freedom, we also need to be aware of other socializing and incentivizing factors that might influence academics to align with their states, such as the media they watch, unusually close connections between academia and government (as in the United States) and the strategic use of research funding (as in China). Indeed, Milanovic notes that the United States has a strong tradition of freedom of speech, but non-US international lawyers often find strong synergies between the positions of US international lawyers and the US government and frequently credit that, in part, to the socializing and incentivizing factors that come with the US government/academic revolving door. We also need to be mindful about how a failure to engage can be interpreted as an unwillingness to listen and how the Western dominance of so many international institutions creates concerns about exclusion and bias. In my book, I document systematic patterns of non-engagement across communities and lack of diversity in international institutions that have nothing to do with concerns about censorship. US academics do not generally ignore French scholars because of concerns about academic freedom. The frequent invisibility of Latin American scholarship and cases within Western international law circles has nothing to do with a concern about propaganda. There is a lot more we could do to diversify our knowledge and networks. And if we are more inclusive on steps one and two, and more reflective and explicit in how we ground our evaluative frameworks in step three, then our ultimate judgments in step four will deserve greater weight. The obvious question to ask at the end of this back-and-forth is, What’s next? Many of the contributors identify where one could take a scholarly agenda from here, for example, from developing and testing instrumental theories about the link between cultural differences and approaches to international law (Stephan) to encouraging greater internationalization of self-contained academies (Rusinova). One can imagine greater in-depth studies of specific national approaches and larger empirical cross-national comparisons. My book also works as a springboard to larger normative questions, such as what the existing diversity means for finding and justifying “international law,” especially in an age of shifting geopolitical power (Ku). These questions are currently being addressed by projects such as International Rule of Law: Rise or Decline? As I say in the book’s conclusion, I began the project by seeking to change the question from whether international law is law to whether it is international, but perhaps the challenge of our generation is in recognizing that these questions are inextricably linked. CfP Deadline Approaching: "Economic Constitutionalism: Mapping its Contours in European and Global Governance"
The European University Institute (EUI) and the School of Law at the University of Portsmouth are organising a 2-day international conference to explore the function and nature of economic constitutionalism within broader constitutional processes in the European and global legal orders. The conference will be hosted by the EUI in Florence on 14 and 15 June 2018. The deadline for submission of abstracts is 28 February 2018. For more information please visit the conference webpage. Joint Symposium by EJIL: Talk! 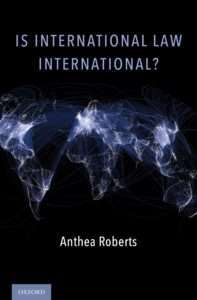 and Opinio Juris on Anthea Roberts’ Is International Law International? The China – EU (US) fight over issues relating to China’s market economy status is attracting growing prominence. In the ongoing EU – Price Comparison Methodologies (DS516) dispute, the WTO panel will need to determine, amongst other issues, whether Section 15 of China’s WTO Accession Protocol is ambiguous and how much importance will need to be attached to the supplementary means of treaty interpretation. Our recent paper discusses a number of weaknesses in the EU’s written submission on Section 15, and the negotiating history of Section 15 under both the GATT/WTO multilateral negotiations and the US-China bilateral negotiations. We believe that Section 15 is sufficiently ambiguous so that the supplementary materials may well be decisive in resolving the dispute. While the records of the multilateral negotiations provide little guidance on the status of Section 15, the records of the US-China bilateral negotiations show convincingly that the compromise reached between the US and China on Section 15 was that while China accepted the application of the special antidumping rules, the US agreed that these rules would remain applicable for fifteen years only. Furthermore, the Sunset Clause of Section 15 was intended to apply to the special antidumping rules as a whole, and was not intended to be limited to any part of the rules. In addition, the records provide no support for the “Shifting in Burden of Proof” approach proposed by the EU and the US. The evidentiary burden under Section 15 was not discussed at all in the bilateral negotiations. The importance of the bilateral negotiating history is attributed to the fact that the language of Section 15 was negotiated and drafted in the US-China bilateral talks, and was subsequently transposed directly into China’s Accession Protocol. No GATT/WTO records publicly available suggest that the final text of it, as negotiated and drafted by the US and China, does not reflect the common intention of the WTO Members. It must be noted that the WTO-legality of the EU’s new AD methodology is a separate issue in the dispute, which, following the recent AB decision in EU – Biodiesel (see my WTR paper), will continue to test the flexibility of Article 2 of the AD Agreement in relation to the use of surrogate prices or costs based on state intervention and market distortions. The paper is really interesting, and has details on the negotiating history of Section 15 that I had never seen before. Third, India argues that the United States’ request for authorization failed to specify a proposed level of suspension. This too is simply incorrect. Thus, the U.S. request sets out the “level of suspension proposed”, in the terms of Article 22.6, in the form of a formula commensurate with the trade effects caused to the interests of the United States. 4See, e.g., United States – Measures Affecting the Production and Sale of Clove Cigarettes: Recourse to Article 22.2 of the DSU by Indonesia (WT/DS406/12) (“…the level of suspension proposed is equivalent on an annual basis to the nullification or impairment of benefits accruing to Indonesia…”); European Communities – Measures Affecting the Approval and Marketing of Biotech Products: Recourse to Article 22.2 of the DSU by the United States (WT/DS291/39) (“…the United States requests authorization from the Dispute Settlement Body ("DSB") to suspend concessions and other obligations with respect to the European Communities under the covered agreements at an annual level equivalent to the annual level of nullification or impairment of benefits accruing to the United States resulting from the European Communities' failure to bring measures of the European Communities and its member States concerning the approval and marketing of biotech products into compliance with the recommendations and rulings of the DSB…”); and, in United States – Continued Dumping and Subsidy Offset Act of 2000 (DS217 and DS234), requests by the European Union (WT/DS217/22), Brazil (WT/DS217/20), Japan (WT/DS217/24), Korea (WT/DS217/25), Canada (WT/DS234/25), Mexico (WT/DS234/26), Chile (WT/DS217/21), and India (WT/DS217/23). Second, with regard to the comments made today by Canada, China, and Brazil, we note as an initial matter that the suggestion that the U.S. request does not specify a proposed level of suspension is incorrect. It is unclear whether these Members intend to suggest a request under Article 22.2 of the DSU should specify a monetary amount or include a detailed formula, but neither is required by the text of the DSU. We would refer these delegations to prior requests made under Article 22.2 of the DSU. While some requests have assigned a monetary value to the proposed level of suspension,others have not. Several requests have been made for a level of suspension commensurate with the annual level of nullification and impairment. While some such requests may have included an indicative monetary value for the first year, the request was nevertheless for an amount to be determined formula as commensurate with the annual level of nullification and impairment. We would also note India’s request for authorization in the dispute United States – Continued Dumping and Subsidy Offset Act of 2000 (WT/DS217). We find it interesting that India complains that the U.S. request does not specify a monetary value for the proposed level of suspension, when India itself has not included such a value in the past. In any event, the DSB need not debate today what some Members consider “should” be included in an Article 22.2 request, as opposed to what the text of the DSU requires. The U.S. request did in fact specify the proposed level of suspension consistent with Article 22.2 of the DSU. Consider the EU’s request under Article 22.2 of the DSU in United States – Measures Affecting Trade in Large Civil Aircraft (Second Complaint) (WT/DS353). There, the EU “request[ed] the DSB to grant authorization to the European Union to take countermeasures that are appropriate, and commensurate with the degree and nature of the adverse effects determined to exist, respectively.” This statement is not unlike the framing of the U.S. request. We would also refer delegations to other requests, such as Indonesia’s request in United States – Measures Affecting the Production and Sale of Clove Cigarettes (WT/DS406), where Indonesia did not include a monetary value or a detailed formula. That request is almost identical to the request that the United States submitted in this dispute. A full list of DSU Article 22.2 suspension requests is available here (DSC subscribers only). Most of the requests indicate specific monetary amounts, but the U.S. is correct that some of them are more vague about things. It seems to me that at some point in the process, the party proposing to suspend concessions or other obligations needs to indicate with some specificity the amount of the suspension, either by providing an actual amount or by offering a detailed formula to be used in calculating the amount. Ideally, this would be set out in the Article 22.2 suspension request. If it is not, the responding party has no way to evaluate whether it should object to the proposed level of suspension and therefore whether to have the matter referred to arbitration. As a result, the Article 22.6 process could be undermined. Alternatively, I suppose, the responding party could object even without having any sense of the proposed level, and then during the Article 22.6 arbitration process the complainant would offer more details. As long as the Arbitrator is able to evaluate whether the level of proposed suspension is equivalent to the level of nullification or impairment, the process should work. Linklaters LLP seeks a second year+ PhD candidate or postdoc working on trade law to assist in preparing regular updates on trade matters. The time commitment would be approximately eight hours per week. Location unimportant. Please contact Dr Lorand Bartels (Lorand.bartels@linklaters.com) for further details.